The Beginner's Dictionary of American English Usage has been carefully designed with the learner in mind. First, it contains the 4,000 most commonly used words in English. These are the words found in beginning and intermediate English-language textbooks. Secondly, each of the entries has at least one example sentence (in bold type) to show how the word is actually used in everyday speech and writing. 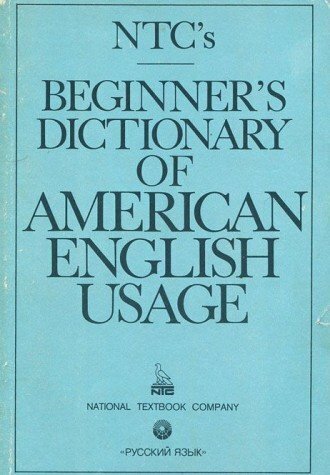 Thus, more than a dictionary, this unique reference is a guide to contemporary American English usage. In addition, this dictionary offers a variety of other features that make it a valuable reference for all students of English. The pronunciation of main entry words is clearly shown in brackets next to the word defined. Parts of speech are identified for all entries. The meaning of each word is explained as briefly and as simply as possible, using only the words contained in this dictionary. And whenever a word has several meanings, they are listed separately, each with its own example sentence. You will also find many notes that give valuable advice on some of the more difficult aspects of English. (These and other useful language aids are highlighted in shaded boxes.) And throughout the dictionary, you will discover fully labeled drawings that illustrate important topics of everyday English vocabulary: the bathroom, bedroom, parts of the body, clothes, the country, kitchen, living room, office, restaurant, street, and travel. These drawings appear in the alphabetical order of the entry words they illustrate. The Beginner's Dictionary of American English Usage offers students an important key to the everyday vocabulary, grammar, and usage of English. Used in class or by individuals, this book is an ideal reference that will lead its users to a more complete mastery of the English language.